Farms and fields across sub-Saharan Africa are full of everyday heroes. Smallholder farmers, both men and women, overcome incredible odds every day to feed their families. Many times women are at the heart and center of these family operations and as a result, are a key part of Africa’s agricultural prosperity and future. And yet, all too often women are left out of decision making at the farm level and are underrepresented in discussions at the policy level. The struggles and triumphs of African women farmers, these everyday superheroes, are the focus of the new dramatic film Kumekucha: FATUMA supported by Africa Lead. Filmed in Tanzania’s fertile Arusha region, the film follows the main character Fatuma and her daughter Neema’s dramatic journey in search of recognition for their uncompromising contributions to their family farm. Fatuma, played by actress Beatrice Taisamo, is a traditional rural woman who has always risked body and soul, without reward or thanks. She does this to farm her husband’s land and keep the family fed and cared for. Throughout, she fights unfavorable weather, pests (Fall Armyworm) and poverty. However, when her husband squanders her prized harvest and schemes to marry off their daughter, Fatuma has to make her biggest stand to protect her family. The film explores a handful of difficult but accurate realities for women in agriculture and agribusiness in sub-Saharan Africa. While women contribute a significant portion of the labor for Tanzania’s agriculture sector, decision-making around farming can be dominated by men. Unfavorable regulations and biased socio-cultural norms negatively impact agricultural productivity by reducing women’s access to resources including training, finance, equipment and the right to own land. At the same time, Kumekucha: FATUMA underscores the great determination and contributions by women in agricultural communities across the continent, including the powerful impact of women-led cooperative businesses and community-led women's savings groups. Featuring artists Beatrice Taisamo, Ayoub Bombwe and Catherine Credo, Kumekucha: FATUMA is the second of two films inspired by the characters and story lines from Tanzania’s popular agriculture-focused weekly radio drama Kumekucha. The film is a follow up to the successful first feature film Hadithi za Kumekucha: TUNU. On March 1, 2018 in advance of International Women's Day, Africa Lead and its Tanzania partners, USAID Tanzania and Media for Development International (MFDI), celebrated the world premier of the Africa Lead supported film. Over 150 guests including the film's cast and crew, Tanzanian government officials, USAID and Feed the Future program partners, local agriculture and women's groups, youth entrepreneurs, and media houses covering the event, attended the premier. The event was similar to the red carpet event held for the premier of Kumekucha: TUNU. Prior to the screening, Africa Lead and MFDI hosted a media briefing which not only included statements by the cast and crew, but also from local women and youth agribusiness entrepreneurs supported by USAID and Feed the Future programs. With the support of the U.S. Government in Tanzania, through Feed the Future's Africa Lead program, the film aims to recognize the challenges addressed in the film and champion the role of women in the agricultural sector, reflecting the U.S. Government’s commitment to partnering with Tanzania to empower and involve women in all aspects of society. 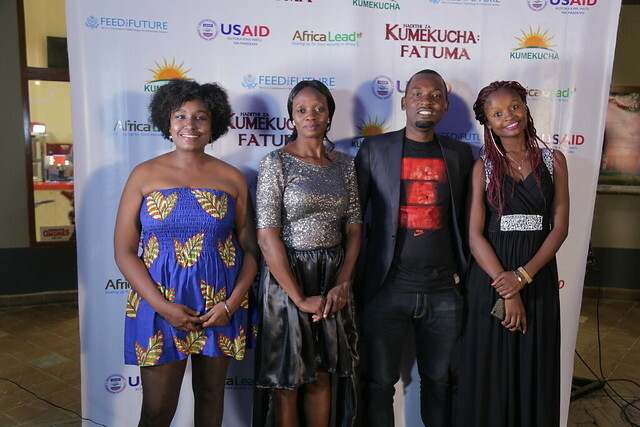 In the face of rising youth unemployment and under representation of women in agricultural leadership, Africa Lead’s Kumekucha (“It’s a new dawn” in Swahili) media campaign seeks to inspire youth and women to become champions for and participate in Africa’s agriculture future. The continent’s agriculture sector makes up over 15 percent of the continent’s GDP on average and offers opportunities for jobs, food security, and countering violent extremism. Africa Lead partnered with MFDI in January of 2016 to develop the Kumekucha campaign. Specifically, Kumekucha consists of a 52 week 30 minute radio drama (July 2016 – July 2017) and two feature length (90 minute) films Kumekucha: TUNU (released in April 2017) and Kumekucha: FATUMA (March 2018). The multimedia activity uses a storytelling approach to highlight challenges, but more importantly the rewards that women and youth can reap from participating in the agriculture sector.